Otello has been working with a number of Italian, European and North American tour operators for several years and follows old Roman traditions to provide competent, thoughtful service to small and large groups. Our dining rooms can comfortably seat 150 persons; we also have a private dining room “LA SALETTA”, for a maximum of 40 persons, perfectly suited to smaller groups who prefer an elegant and more intimate atmosphere for private lunches or dinners. Here are a few examples of the menus suggested to our partners. 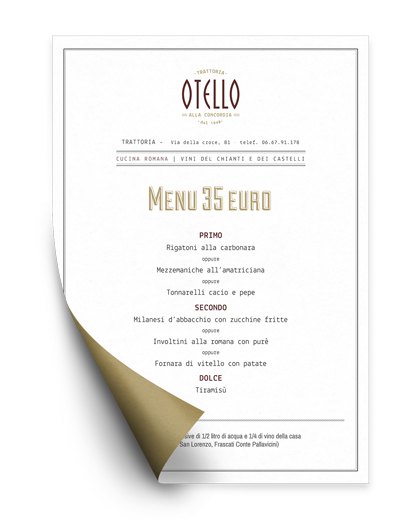 All menus may be tailored to our clients' requirements.